We attended the first seminar of 2018 of The Wing Chun School, which was delivered by Sifu Garry McKenzie. Once again it was a no nonsense, tell it like it is (and do it too!) affair. 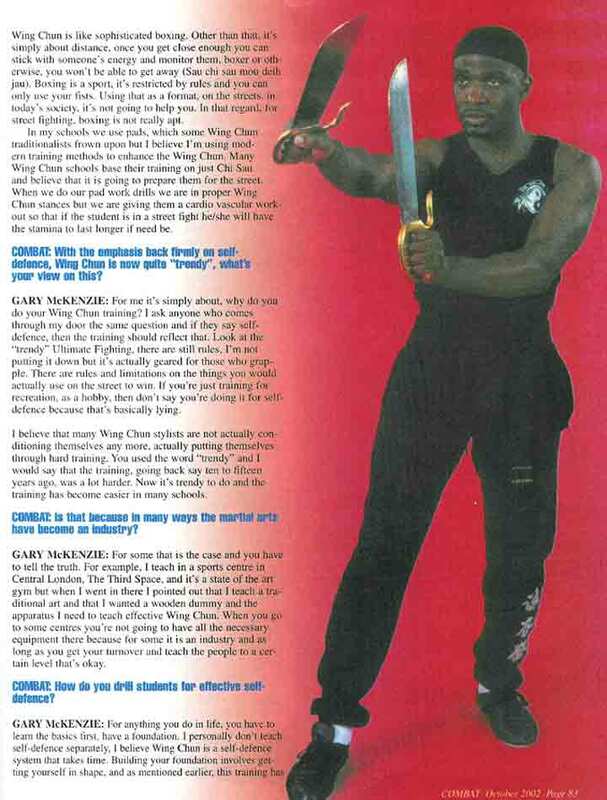 Characterised by Sifu Garry's uncompromising meticulous approach to teaching and practising the martial art of Wing Chun. We were guided, in a step by step manner throughout the sessions. As always with my reports, you can't learn wing chun techniques just from this write up. Students will want to practice what is described here. You'll need to go to your Sifu to get the practical details and be taught this if you missed it or want to clarify the techniques discussed here. Remember also that if you attended the seminar then get together with others who also did so and practice! Chi Sau is the main part of any Wing Chun system. Understandably then, the effectiveness of our Wing Chun will depend on the quality and state of our Chi Sau . To develop our wing chun as an effective combat system requires us to be steadfast practitioners, with an unwavering and determined approach to our development in this martial art. At the seminar, Sifu Garry therefore asked some important questions. He asked, "What is the point of Chi Sau?". In addition, since there is no chi sau on the street, he asked, "What is our attitude when doing chi sau?" On this point Sifu Garry commented, "If you chi sau with anyone, that is no indication at all of your or their combat skills". That last line worth reading again! The purpose of the seminar, Sifu Garry explained, was to help students "practice chi sau to help you combatively". He continued, "Students should ask themselves 'Are you doing chi sau with a combative mind or just point scoring?' As soon as you touch hands, your opponent will know what time of day it is. Talk is cheap, but you'll know when you touch hands. You might be able to see by how someone carries themselves, but touch is best. They'll know when they feel the danger. My partner/opponent will know I'm there and they'll be saying I haven't got a choice but to get myself together." So Sifu Garry went on to explain that our basic number one strike in bong lap sau chi sau must be far superior to our opponent's, the level must be higher. He also warned of the feature of advanced students who have left the basic elements of wing chun behind and carried on with the "advanced" stuff. Their level is just not there and they get caught by strikes from beginners/less advanced students. Note: A common feature of many of the drills is that we concerned ourselves with applying a one-two combination and also practised for and expected our opponent to throw a one-two at us. Chi sau is not just about basic strikes and counter, the technical stuff. There are some basic requirements. If a student trains he/she never lets him or herself stop for a rest in the training. Doing this means they are not serious in their training. There is no break. Therefore conditioning is the first prerequisite. Secondly is to never complain if you get hit. Rather your opponent is helping you to find areas to develop, since weaknesses have been revealed in some aspect of your wing chun. The seminar focussed on three of the four chi sau that we practice at The Wing Chun School. These being bong lap sau chi sau, pak sau chi sau (which was developed by Sifu Garry) and Pun sau. Dan chi sau has no combative element as it is concerned with teaching structure and position of the three seeds of wing chun (bong sau, tan sau and fuk sau). Bong Lap sau chi sau is about the whole body doing the chi sau (stance, structure, attitude within the technique, that is forward energy). When you first engage with your opponent you have to test what they have from the word go. As soon as you touch hands what is the state and level of their stance and structure? For your bong sau to be good you need a good stance, not to be wobbling on first contact. The whole body is doing the technique. If your opponent wobbles when you first clash, then that may well help to psyche them out from the outset. Thus, having no stance means having a weak bong sau. The bong lap sau chi sau is not performed as a playground pitter patter game, it must be explosive. Hold the opponent's arm firmly for the lap sau and punch forward with intention. Don't just practice or roll lightly and then explode when doing the attacking technique. Chi sau then, must have intention. The effect or result of practising in this way is that it conditions the forearms in readiness for real combat. It is known that when we practice we are encouraged not to be bashful or shy about expressing our wing chun, we should be giving our best in order for us to see if the person can handle it. Practice: One of the basic practices we did was bong lap sau chi sau moving up and down the hall vigorously, as said before. The bong sau redirects the punch and we turn, the step back is a third component and allows us to additionally get out of the way or move away and also find the angle we need to affect a counter strike. If our opponent's bong sau is good then we need to have a good stance, and as said above, not wobbling but trying to psyche the opponent out with our forward energy and stance. This is a chi sau specific to The Wing Chun School and was devised by Sifu Garry McKenzie during his boxing circuit days. At the time he found it a challenge to close the distance against his boxing opponents. 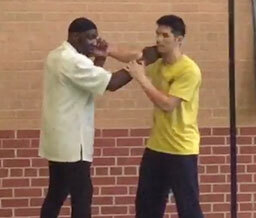 He devised this chi sau as a way to close the distance whenever a jab was thrown by the opponent. He then took this into the wing chun practice and developed it further for combat. With pak sau chi sau comes the need for speed, Sifu Garry warned against cutting corners, and in the need for speed, dropping hands or not maintaining contact with the opponent when closing the gap. A basic requirement to develop good combat skills is to ensure our hands stay up in chi sau and in the mêlée of an attack or a counter. The Siu Lum Tao form teaches us from the outset to place a wu sau in the centre. We need to use and maintain the wu sau in this same position, in all our chi sau. Drill 1 - Within the pak sau chi sau from our maan sau, rather than the standard pak and punch, we will pak and punch and then throw a cross, like a one two. At the same time we keep our wu sau hand up to avoid getting hit by the opponent's lead jab or cross. Drill 2 - Alternatively to drill 1, perhaps he throws the cross as above and we use the wu sau and turn into scalene triangle and punch. So this means that as soon as he pak saus we go into a scalene and punch. This means we must once again keep the wu sau there. Drill 3 - This was a sneaky approach where we pak sau and throw a hook immediately instead of a straight punch. It is a very unexpected attack and will catch someone whose hands are not up and ready. Drill 4 - Should your opponent do this to you (drill 3), your main defence is to keep your wu sau hand there so he can't throw the hook and you can punch with the other hand. Followed up by a chain punch or a one two. Sifu Garry explained the importance of a good stance, ensuring that we maintain a tight structure so that the opponent cannot get in. He reminded us of the importance of chi sau with forward energy, not flailing our arms and elbows out nor up and down. The intention is to unseat our opponent and always ensure we have a tight structure as a form of defence whilst we also are going forward looking for openings and weaknesses to exploit and to launch an attack at the right time. He also emphasised the need to step forward in a direct line on the centre, rather than step out to the side which would invite a counter from our opponent and create openings from where we could be attacked. The basic drill practised was moving forward with a tan sau towards our opponent. And also moving forward with a bong sau towards our opponent. Developing the foot work and ensuring that the structure was maintained at all times. This drill benefits both you and your partner in maintaining structure and footwork. Our pad work is characterised again by keeping the hands up at all times, for both the holder of the pads and the person responding to attacks. We practised pad work backwards and forwards, ensuing we kept our hands up and with the wu sau position at all times. Our opponent would then throw a hook, which we blocked with our wu sau solidly and threw a jab at the same time to stop the opponent, then followed up by a cross. It's a one two combination. We practised pun sau, with a turn at the bong sau in order to occupy both hands and lap sau with our fuk sau and punch through the centre of the opponent's position. The key to this move was to trap the lower arms whilst we lapped the upper arm. Sifu Garry has worked tirelessly and in a committed and dedicated manner to developing his wing chun and also in developing The Wing Chun School. He encourages and cultivates the highest standards for students and Sifus. He attends gradings at branches around the country and abroad and runs the gradings and classes at Hackney HQ. Acting as guide, teacher and advisor to the many sifus and students that seek his time and help. In this endeavour he has been equally and magnificently accompanied by SI Mo Julie, who works again tirelessly and with commitment to ensure the school runs smoothly, doing all the background administration, planning the Hong Kong trips and seminars, arranging gradings, licensees and uniforms across all branches, and ensuring the sifus are up to date with their health and safety and first aid, child protection, as well as managing the School and Sifu Garry's diary. Si Mo also teaches in many classes. Thus between them both, Sifu Garry and Si Mo Julie have created one large and extended family, which we know today as The Wing Chun School. As students and sifus we acknowledge and appreciate this and are grateful and also willingly we support their work. We therefore showed our gratitude for the efforts of Sifu Garry and Si Mo Julie through a presentation ceremony which we sprung on them both at the end of the seminar. It was most skilfully announced by Sifu David McKenzie, Sifu's brother. Suffice to say, Sifu Garry was taken unawares, and both Sifu and Si Mo were very emotional in reaction to the gifts and sentiment (see photos). Sifu Garry in his response was gracious and appreciative (and a little embarrassed by all the fuss we had made over them both! ), and Si Mo was likewise needing to find a hiding place to conceal her blushes (and perhaps a tear) . Sifu Garry observed how we were a family at The Wing Chun School Students, and instructors and students alike do what they can to ensure the school thrives and maintains a culture of learning and dedication to developing ourselves and the art of Wing Chun. Here ends my report back on the seminar, this is every students' work in progress, keep practising and speak to your Sifus for help and support, seek each other out to train and get together. Keep it real and maintain the combat attitude. We just had our much-anticipated seminar delivered by Chief Instructor, Sifu Garry Mckenzie. The seminar was a full on physical seminar in which Sifu Garry took us through some bread and butter skills that all students should have whether beginner or advanced. The seminar helped all students crank up the combat attitude. With well over 100 students and instructors participating we were reminded that we are but one large family of students. All working together and supporting one another to learn wing chun. Personally I always look forward to these seminars, because we get a detailed seminar along a theme, and always get plenty of practice and hands on experience. Getting hands from all the students, of all sizes and strengths and qualities is so very valuable to develop our experience and skill. The seminar was structured in such a way that it benefitted beginner advanced and intermediate. The techniques utilised were the basic or fundamentals and accessible to students of differing ability and skill. There were some key learning points to take away and implement, and over this last week I have heard students and instructors alike saying that they had been "training" or doing "lin gung", as is explained below. So what did the seminar tell us about our combat strategy and philosophy? 1. We were asked to think about what the most important thing is that we have to defend ourselves in a real situation. Students answered eagerly and well. The answer coming back from Sifu Garry (Si Fu) was that "You are the weapon - do not neglect the body conditioning". To achieve this, a wing chun martial artist must maintain good stamina. Sifu stressed the importance of punching and training every day, saying "you must punch every day to be serious about your wing chun and be a martial artist. In this way you are preparing and in readiness for combat. In days of old, if a martial arts Sifu ordered students to do 1000 or 2000 punches a day it was done without question. But things have rather changed nowadays. 2. Lin jap and Lin gung. SIfu explained to students that we must understand the difference between practice, as in class practice to develop the techniques, this being "Lin Jap" in Cantonese, and training to condition oneself and push oneself to become better and combat ready, this being known as "Lin Gung". 3. Sifu relayed the advice that one should not fear the man (or woman) who knows one thousand techniques but has only practised them a few times, rather s/he should fear the man who knows only a few techniques, such as a punch or a kick and has practiced it thousands of times. (An often quoted saying made famous by Bruce Lee). Combine this practice with the resultant development in stamina, and it is possible to appear that you have released a poltergeist during a combat altercation. It will not come out if you have not practised diligently. Once the introduction was done the seminar got into the practical activities, and it was all systems go! 4. The first half of the seminar looked at developing that endurance through practice in a non-pressured situation. Students were able to test their own stamina and mental endurance under no-pressure or threat by doing some basic exercises. Simply chain punching focus pads for 3 minutes continuously. Suffice to say, no one really lasted the 3 minutes without slowing, faltering and some struggling to continue! A real eye opener. This was followed up with similar timed drills using turning punch, arrow walk up and down. Sifu then concluded by explaining the purpose of the drill. Ideally we would like the fight to be over in 3 seconds, but it could go on for much longer, therefore we should train and expect a fight to last up to three minutes. Therefore we must train at full force for three minutes on all the basics. This is so because we may not just be faced with one attacker with one heart and one pair of lungs. Rather we may be faced with two or more attackers, in the former case, two hearts and two pairs of lungs fighting one person. This demands a high level of stamina and also other elements to be brought into "Lin Gung" or training. There are four important elements to work into our training. As well as stamina or physical endurance, we have to work on speed, power and accuracy. Some of these can be built into the simple 3 minute drills as above. There are numerous other ways to develop these which this review won't be addressing and which every instructor of The Wing Chun School will help students to develop and integrate in their training. The first half of the seminar Sifu Garry commented on the modern phenomena of what I might term as arm-chair or spectator martial artists. In a voice expressing astonishment and surprise he explained that today's martial artists like to be impressed by others, for example on YouTube etc and to also praise others' work. But these same martial artists neglect to develop themselves. Sifu Garry said he was not impressed by anyone, but is certainly impressed by someone who trains and follows their system, in whatever martial art they are involved in. They are better to look at their own training. We follow a system, and that is why we can see that system expressed in all the students. The second half focussed the students on being able to utilise their skills, their body and techniques in combat scenarios. That is, when we are attacked, when under pressure, what have we got in response? Do we have a punch, the footwork, that works under pressure? Again Sifu kept things very simple and basic. Attacks consisted of a basic attack from a front approach, and either using a straight jab or kick or a hook punch coming from the front or rear hand. Students were asked to utilise either a side step (pong ma) or an angle step (gok ma) or in later drills a darting step (biu ma). The drills were designed to enable us to practice taking the angle on a forward approach using gok ma, and countering with a one two combination. Or else biu ma and use of biu sau (or a simple palm to the face) then a kick to the groin area followed by a one two combo. In this section SIfu explained the importance of pad work and how to operate the pads for the partner/act as coach. Pad work was done precisely to develop accuracy and position, and later to develop some speed and reaction. The scalene triangle or rather turning the upper body via the waist to evade oncoming rear or lead hook using a tan or biu sau and simultaneously delivering a straight punch, then a chain punch pursuit. These were later developed using pak sau chi sau and also bong lap sau chi sau. Students had an opportunity to practice being elusive in their striking and not telegraphing their attack during bong lap sau chi sau with fast palm (jing jeun) and chain punch. We were then shown and practised bong lao sao chi sau with jing jeun, where our palm strike is stopped and push back at us forward and we let hand go past and punch in a one two or more combo, once again turning and using hips to evade and counter and chain pursue. It showed how the scalene triangle was formed with the use of hips turning and maintaining the wu sau position in a combative mode. Palm relaxed, forearm up and ready to punch. As I said above students were certainly enthused by the seminar, and it was an eye opener and a challenge for many. 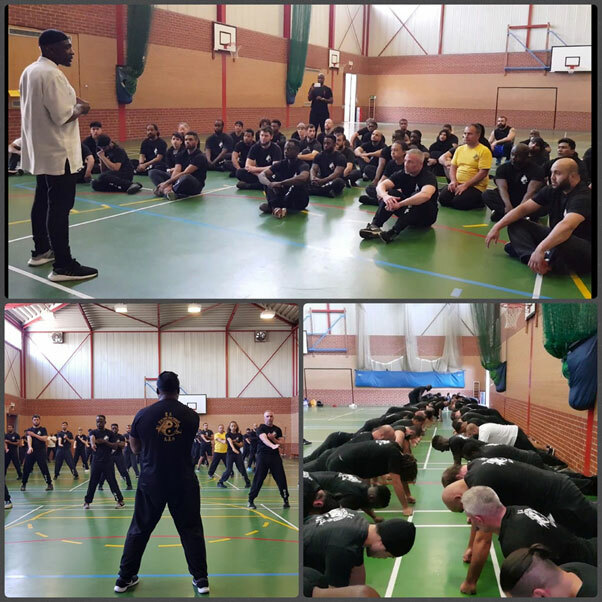 One student commented that "I loved the seminar and that it used the basic techniques within self defence to devastating effect.". Another commented as follows "top draw seminar and an eye opener and thank you", and a Sifu said "My student went as it was his first seminar, he loved it and can't wait for the next one." Another student commented, "The seminar was well paced and well balanced. It was engaging as well as informative with a high quality content all put together in a simple language. 10/10. So far attended 3 seminars in the last 2 years and even though they were all great, this one still managed to stick out. I always make sure I'm free for any of those as not attending would be a considerable loss." What I really enjoyed was going round assisting with the coaching I could see how the students from every branch really tried to implement the elements, they were putting 100% into their efforts and bringing the drills to life. There was no ego in there at all to get in the way, just wanting to learn and improve. There are some great photos of the seminar and also a video to follow. Sifu thanked us all for coming, and all who helped before and on the day. We also gave our thanks to Si Fu Garry for the seminar and how he had made it so interesting, relevant and practical, as always. As is customary we took group photos at the end and then headed on for a celebratory meal, where being amongst The Wing Chun School Sifus and students, is always fun and good to catch up and was enjoyed by those who attended. I'm looking forward to the next seminar. In the meantime Sifu reminded us to keep training so that the next seminar can build on what we have covered. I write this article in the hope that masters and disciples will be inspired by the man, my friend, brother and disciple, Peter Coker. 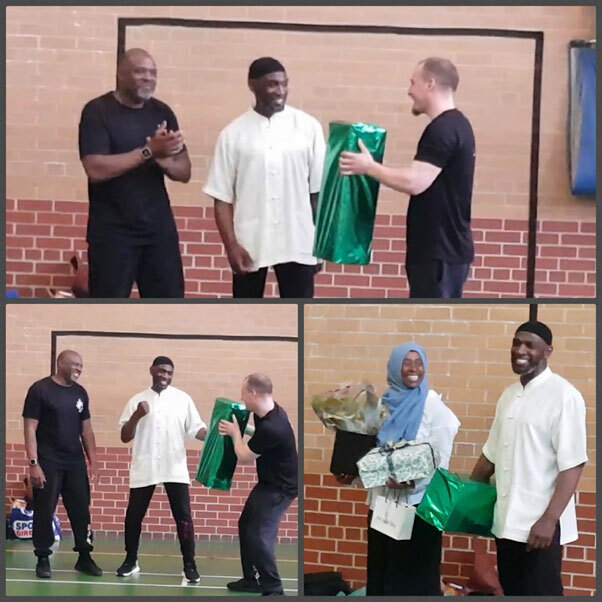 I met Peter Coker around thirteen years ago, at the second school I opened for the Simon Lau Martial Arts Academy in Edmonton Green, North London. Peter, like myself, was originally a Simon Lau student, and followed me merely because at the time it was more convenient, my school being closer to where he lived in Tottenham. 'Tou dai', or 'hok tou' are Cantonese used to describe the individual as an apprentice learning the Master's skills - rather like a Jedi in the Star Wars movies. The relationship between master and apprentice is a special one. For martial art traditions still exist, even in this modern world. From the time I knew him, 'Brother Peter' as I called him, was the epitome of a tou dai. Where many students have come and gone, disciples like Peter 'The Rock' Coker, have deviated neither to the left or to the right, have uplifted, built up and complemented their sifu ( 'master' ) and their Wing Chun brethren. Fellow students admire such disciples. Their skills are unsurpassed and respected because they emulate the master so closely. Even in the master's absence he is in a sense still with them, since the master's co-worker and apprentice has everything in hand. Standing in for the master is never a chore for a disciple since he has the same passion for the art as his sifu. No money changes hands and his actions are inspired simply through a love for the art and his sifu. The master's co-worker treats younger students with care and attention - as if they were his own. The tou dai has no desire to take what is not his, knowing there can be one master. This was the calibre of my Brother Peter. We had to re-establish ourselves in 1990 when The Wing Chun School was formed and we were no longer under the Simon Lau Martial Arts Academy. Top class fighters from among us were sent into WAKO and BKBU Kick Boxing tournaments because we were only interested in full-contact bouts. We came away unbeaten. Peter retired as an unbeaten BKBU full-contact champion and alonside him were fellow students Jerome Caprice, Calixtus Marcel, Ian Morris, Winston McKenzie, Kola Fajimolou, among others. These took care of the school. The si-hings ( 'elder brothers' ) dealt with any troublemakers who came to the school ( trust me we had our full share! ). The whole Wing Chun School gathered around Christmas time for our annual meal. Peter, through his one-liners and practical jokes, was the life and soul of the party. He did not attend our annual gathering for the first time last year, and was sorely missed. 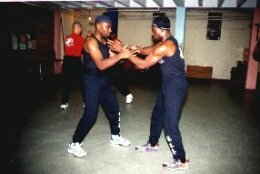 I began teaching Wing Chun at the Third Space in London's West End, during May last year ( 2000 ). Peter still managed to come to training and assist me with the classes despite having lost a lot of weight. Even thought he was in much pain, he still made it down - just to be among us. Training more than the teaching, I guess, was his life. I remember that he still had plans - though these came to be known over some of the last days any of us saw him. "Sifu, I want to open a school for you when I get back"
This suprised me because Peter had never expressed a desire to open his own branch. I spoke to him on the phone a few weeks later because it had been a while since I had last seen him. He told me, "Sifu, I'll be back. Don't worry!" A week later I received a call from Lewisham Hospital. "Hi Sifu! I'm at Lewisham Hospital. I'd really appreciate a visit from you and some of my brothers. Please bring some books on Wing Chun or Combat for me." On my first visit I was amazed to find Peter with a skipping rope, books on Wing Chun, handgrips and all. I was also told he had been spotted doing dips on the Zimmer frame provided ( one he chose never to use as it was intended ). I remember that he retained his wit and warrior mind throughout. Peter continued to focus his mind on training even when he had but a few days left. And as for me, his sifu, how could I have known that the last day I visited Peter would be the last day I saw him alive. Although our sifus inspire us, few have disciples who inspire us, but Peter was one who did. 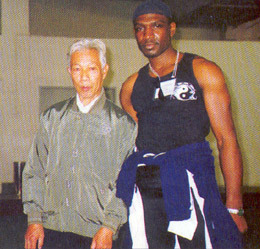 Everything he did involved Wing Chun. Even his closest friends, outside of Wing Chun and his family, did not realise how good he was because he never boasted about it. So what is the point of this article? There are two reasons behind this article. Firstly, I want my students past and present to know about Peter Coker in the hope it may inspire them. Secondly, I want the world to know of those who, like Peter, go un-noticed because glory is not their ultimate goal in martial arts. So I say to those sifus reading this: if you have such a student - then never take them for granted. Brother Peter was a priceless gem who can never be replaced. Combat: How did you first get involved in martial arts? And why? G. McKenzie: I was only ten, had a rough upbringing and a violent temper, it needed controlling or it would get me hurt or in trouble. I saw David Carradine's 'Kung Fu' and then joined a judo school with my brother David for a year. Combat: What did you do then? G. McKenzie: At 12 I started learning Tae Kwon Do with Mr. Ohiu for 3 years. I appreciated the directness of kicking and punching as opposed to grappling and throwing. What frustrated me was the endless amounts of katas and my constant disqualification's in competitions for excessive force. This led me to learn western boxing at the Colvestone Gym in Hackney (London), training with Michael Watson, Kirkland Laing etc. It was the first time I ever got a full blow to the head - boy it hurt! Tae Kwon Do did not prepare me for these mobile loose, unconventional boxers, who were basically in my face. Combat: How did you arrive at Wing Chun? G. McKenzie: One day I got severely beaten and left for dead by a gang of racist thugs, which made me realize I had to master one thing and one thing only. G. McKenzie: One day I was sparring with a Wing Chun practitioner. Without hardly any effort or movement he blocked whatever I threw at him - I couldn't actually get near him. Wing Chun seemed straightforward, simple, direct and very effective. Combat: Who did you learn with? G. McKenzie: I saw Simon Lau on 'Way of The Warrior' his Wing Chun was simply 'Explosive'. My brother David and I joined a twice weekly course with seventy other students. Combat: How did you take to Wing Chun? 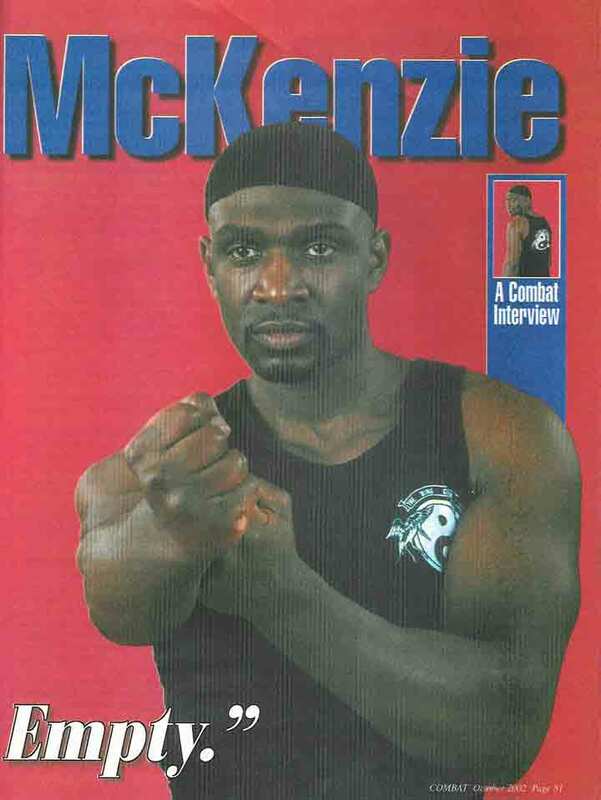 G. McKenzie: I trained hard and progressed well, which is why my Sifu decided to groom me for an instructor and teach me as his private student. David, due to pressures of work and family, dropped out for three years. Combat: How long did you train under Simon Lau's personal guidance? G. McKenzie: For 8 years. You see I had the key to his school - I would train there from 4.30pm - 7.30pm, then take the class until 10.00pm, then work on the door of this nightclub until 3.30am. Believe it or not I would then go back to the school for an hour to train on the dummy before bed. I was only 20, gave up my daytime job, had no wife or family then and plenty of time to train. Combat: When did you break away and go independent? G. McKenzie: After another 3 years of running a branch of the Simon Lau Martial Arts Academy' in Edmonton. I felt the need for independence for the sake of my personal development. No hard feelings it was just time to go, it's like a son leaving his home, his dad is still his dad. I then opened 'The Wing Chun School' in Hackney. Combat: What did you teach? G. McKenzie: Everything that my Sifu had taught me. My own style had been developing for some time, influenced by boxing. I suppose mobility, flexibility and footwork were incorporated to prevent surprises and be ready for anyone. The problem with many martial artists is that they can only fight similar stylists. This is unrealistic, the aggressor might not have any 'style' at all. Remember fight the man not the style. Combat: How do you gear your students to 'fight the man'? G. McKenzie: Firstly, they must have no preconceived ideas about what might happen in a fight - just act or react. 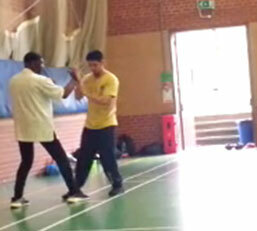 Students come to me to learn to defend themselves so I must prepare them for everyone, Wing Chun allows for just this. As there are only 3 angles of attack, learning hundreds of different blocks is pointless. My students sum up the angle of attack and then counter attack as appropriate. Furthermore training in class is geared towards the way a student would fight in a real situation. Combat: What training is of use for this? G. McKenzie: I have developed a very fast paced drill called 'Pak Sau' sparring which allows for simultaneous attack, block, counterattack at close and long range. There are no fixed patterns - there never are in reality! It's up to the students to attack each other from whatever angle, with whatever combination and whatever part of the anatomy they see fit. The drill never stops, is very fast and heightens the students awareness, reaction, reflexes and speed. Combat: How does your Wing Chun differ from other Wing Chun practitioners? G. McKenzie: Method of training application and as I've said 'fighting the man'. Some students wrongly believe that their 'chi sao' will safeguard them against anyone. This is dangerous and stupid - chi sao is a sensitivity drill not real fighting. Also the attacker might not know how to 'chi sao'. Spar with a boxer and see if his jabs linger in the air for you. Combat: What 'method of training'? G. McKenzie: In my schools, fitness and stamina are essential and often neglected aspects of fighting. My students have physical and equipment workouts - every lesson. We use heavy bags, speed balls and hook and jab aids. At a higher level, the hook and jab pads allow for a full power sparring session using the whole Wing Chun arsenal (elbows, knees, fingers etc.) This can not be done in 'Pak Sau' drills as control is needed to prevent serious injury. The hook and jab drill brings out a student's imagination and individual personality. Combat: Are there limitations to Wing Chun? G. McKenzie: For me Wing Chun is a complete martial art, only people's minds are closed. For them if something is done slightly different, then it isn't Wing Chun. Don't forget that Wing Chun is an expression of concepts. The concept of 'pure' Wing Chun is nonsense - the art has to adapt and change with the times. Combat: What of the politics in Wing Chun, the claims to 'authenticity'? G. McKenzie: These terms - 'pure', 'authentic', and 'traditional' are simply self serving labels to promote business and lend credibility. Does anyone really know the meaning of these words? My Wing Chun is geared towards combat and has been tried and tested countless tines - on the streets and in clubs. The point to all this is simple - does it work? Combat: What are you up to at present? G. McKenzie: Training hard, a lot of teaching, opening up new branches and grooming my senior students. I've been meeting a lot of other Wing Chun Sifus and exchanging ideas - something I rarely used to do, as I believe you should be concerned about your own standard, not other people's. The problem is the amount of politics in Wing Chun generally - too much time wasted arguing about words! We are all Kung Fu brothers! Unity is what's needed, on that I'd just like to add that I will be holding a joint seminar later this year in London with America's legendary James DeMile! 'Wing Chun across the waters....' But I'm sure you'll get all the details soon. G. McKenzie: My pleasure, thank you. I was lucky enough to catch the joint seminar Sam Kwok organised last year. The seminar was both practical and realistic, and applications were stressed. The message was, there's no point in training one way and fighting another. It was lovely to see Yip Ching and Tsui-Suen Ting come together. Their chi sau was breathtaking and while casually chatting about their experiences, they simply blew all the younger guys away. Once contact was broken they would explode forward, following the concept of 'Lat sau ching choi' which translates as 'Stay with what comes and thrust forward when released'. This fundamental law is often forgotten, ignored or passed over. Flashy tricks will only work if your opponent's basics are weak. In reality, people never let themselves get hit about all day long. You might have one chance, perhaps, and that's it! Teaching in class is different. Students are encouraged to attack freely and if I were to close them down each and every time they attacked, then they'd learn little. Anyway it was nice to attend the seminar and enjoy the meal afterwards, when many different Wing Chun practitioners all sat together around one table. A rare event, it seems! Why so much acrimony and politics in Wing Chun community? A vexed question, but one which needs addressing. Of course, people are the problem - people and their greed, envy and preoccupation with labels such as 'traditional', 'modern', or 'modified'. To me, it seems a redundant historical debate! 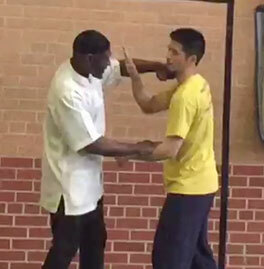 At given points, Wing Chun has been added to, not modified. The pole or the butterfly knives, or perhaps Leung Jan's attempts at simplification are examples of the sort of modifications I mean. At the time these modifications were introduced we might have seen them as modern, whereas today they are seen as traditional. Progress means an on-going development of what has previously existed. There is also an interesting debate about the Yip Man family tree. Having been taught by Yip Man does not automatically guarantee that a student is any good. A great teacher does not always and of necessity produce great students! Indeed, some of Yip Man's students were greater than others. Yip Man taught all students according to weight, height, size and disposition, so what they all acquired is subtly different, sponsoring lines of development with different emphases. The result is that some lines of Wing Chun now appear to some as vastly different from others. Just to complicate matters, there are also, of course, lines of development which have completely by-passed Yip Man. However, the same concepts underpin all these various strands of Wing Chun practice and at bottom, the differences are generally superficial anyway! The only relevance in all this, so far as I can see, is whether or not the individual practitioner is any good. The Chinese ask, 'Can you do it or not?' and this, to me, is the only thing that matters. I've seen Yip Ching's and Tsui-Suen Ting's stuff and it works. Period. As for myself, I teach a unified system with the same basics and concepts taught to everyone. It's only later that an individual's martial maturity blossoms but this can only blossom effectively if set on good basic groundwork. because each student is physically and mentally different, then even though I teach them the same thing, their build/attitude will affect the way they practice. Certain Wing Chun techniques better suit certain situations so, for example, tall students may prefer to stay at mid-range in order to use their legs more. They may also use the natural length of their arms to prevent shorter opponents from closing distance. On the mental side, some students are more enthusiastic and perhaps enjoy closing distance and rushing in. Others may have a more cautious nature, preferring a 'wait and see' strategy. Both strategies have merits and pitfalls but in the end it is the individual's ability that will decide the outcome. My security work has taught me many things which I apply to my Wing Chun practice. Above all, it has taught me common sense. For example, it has taught me never to underestimate your opponent - treat them all with respect because you just never know who you may be facing. Some of my colleagues learned the truth of this the hard way and have suffered stabbings and even the odd shooting! If I see a hand slip into a pocket I react and 9 out of 10 times I've been right to do so. Why let someone arm themselves? So act before it is to late to react! Security work has also taught me how to deal with fear. We all face fear and we must learn how to control it, and turn it in to our advantage - because make no mistake about it, fear can be good! It teaches respect, caution and prudence and properly channelled, it can focus our minds so we develop physical power, speed and energy. I find my Wing Chun ideal for security work. There is often little time or space to manoeuvre in, so its emphasis on direct close-quarters attack is indispensable. It's very fast to operate, allowing you to switch to other possible sources of danger. This is important because you are dealing with a group of troublemakers, it's no good spending a lot of time on one guy. Wing Chun allows you to use one opponent as a temporary shield because dealing with multiple opponents requires totally different tactics to a one-on-one. Wing Chun caters brilliantly for this as well. 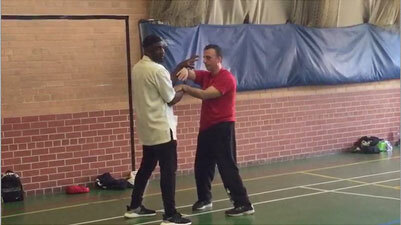 Wing Chun is also useful when a low key response is called for because it contains pins, traps and immobilisation techniques, all of which can be useful. Thanks to my security work, I now appreciate more clearly certain fundamental Wing Chun concepts. For example, I can see the practical use of the Wing Chun concept of interception. Why wait to counter-attack, because if you do, it may be too late! Intercept not only the technique, but the intention. Don't wait for the actual attack but take control before things get out of hand. Get in first. I also learned how important it is to size-up and evaluate your opponent. I am only 5ft 8" tall but I've had to deal with a crazed guy of about 6ft 6". I quickly realised that in any case, my centreline punches would simply not work because I'd need a step-ladder to reach his jaw. So I had to bring him down to my level first! I learned the concept of minimum force a long time ago when my opponent walked straight onto my centre line punch. He was throwing a hook at the time! That didn't matter though because he ended up with extensive facial injuries and the police became involved. Thankfully they later dropped charges, though they remained convinced that to do the damage I did, I must have hit him with an iron bar! They were hostile and aggressive up until my solicitor told them I was a martial artist. Then they seemed to accept my story - that I didn't hit him with a bar. With the title 'martial artist', I suddenly became Bruce Lee in their eyes. I might have been crap for all they knew but the label 'Martial Artist' and the hype surrounding it convinced the police. This is indicative of a general attitude about martial artist. Yet I know many non-martial artist who can do the business and many so-called martial artist who can't. Many students join my club because of word-of-mouth recommendations based upon my no-nonsense reputation. But how can an inexperienced beginner tell if the club he is joining is really any good? In the end, there is no simple solution. In my view, too much emphasis is laid on learning from a top, well-known teacher. Only one person can be the best, so does this mean that all the rest of us are second rate? Would Yip Ching be second-rate if Tsui-Suen Ting was considered the best? Many teachers are worth their salt and in any case, even the best can't turn an unsuitable student into superman. Whatever the standard of the teacher, the standard of the student is also important and regardless of who teaches you, it will take a lot of sweat, tears and commitment. But as it is, the 'My Sifu is the best' remains the most common cause of all the politics. So my message is: be the best YOU can be! So when searching for a true master, treat such things as origins, training history and reputation as no more than sideshows. These say what he is and what he has done but they don't tell you the most important thing with any teacher, and that is, his ability to teach! It doesn't matter who he was taught by, or where he was born. My Cantonese teacher, Victor Appiah, suffers from a public perception that he cannot teach Chinese properly because he is not Chinese. 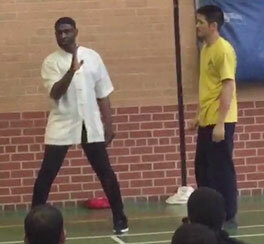 When some European pupils first see a black teacher of a Chinese martial art, their faces say it all! Incidentally, I study Cantonese in order to research the origin of, and the terms used in, Wing Chun. This has led me to a love of the Chinese language and culture. In Wing Chun, crucial concepts are contained within proverbs like for example, 'Lat sau ching choi', or 'Kil sau ma bo' which literally translates as 'Bridge hand horse stance'. The implication is that arms and legs have to be strong and ready when fighting. These proverbs are not easy to put into English and are often left untranslated - yet they still need to be explained to serious students because they embody fundamental precepts of practice. My next seminar will deal with Wing Chun forms and concepts, and their combative applications. The seminar will be a workshop open to all martial artists. No chi sau will be examined; rather we will concentrate upon speed, simplicity and directness. We will look at ways of finishing the situation before any chi sau is needed. I find that it only really goes further than this in the street if the aggressor is good enough to counter your attack. Only then do the benefits of chi sau come into play. 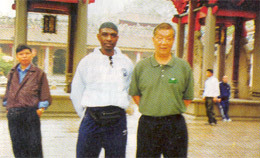 Garry McKenzie with Top Wing Chun master Leun Gai in Faat Saan. Is Kung-Fu Difficult? 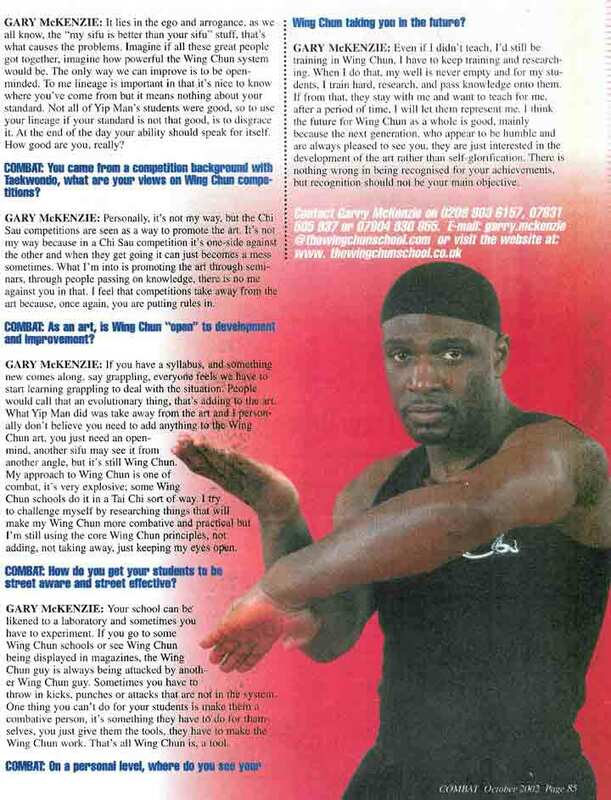 - This is a question which I put to Wing Chun Kung Fu sifu Garry McKenzie, who besides teaching Kung-Fu, speaks fluent Chinese ( Cantonese ), and is able to read and write in Chinese too. He visits Faat Saan ( Buddha Mountain ) in Southern China, the home of Wing Chun Kung-Fu, yearly where he trains and discusses martial arts issues with many famous Wing Chun masters. 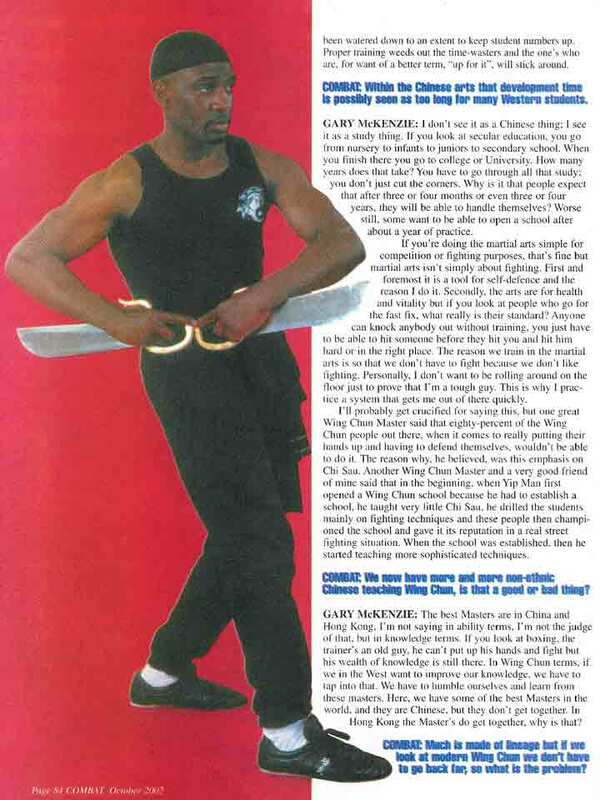 I tracked Sifu McKenzie down to his club in Central London West End, and this is what he had to say, - learning Kung-Fu is not so difficult. "It's just like going to school. It can be divided into three stages, each stage requiring three years or more of training. The first stage is basic works; the second stage is to consolidate it; the third is more advanced instruction and then refining it to perfection." "The satisfactory completion of the first stage is said to be a minor attainment, the second a moderate, and the third a major attainment. As there is no clear distinction between the first and second stage, it is more commonly referred to as 'three year a minor attainment; ten years a major attainment.'" "A minor attainment implies the establishing of a solid base, which is equivalent to junior high school. To have achieved a major attainment is like having gone through university and doing more advanced and specialised study and research. How much one achieves in their mastering of Kung-Fu depends on how much effort one puts in. Similarly, how one performs in school depends on how much time they spend on their homework. Having a good teacher or competent instructor is important, but personal effort is of paramount importance to the final result." "Foundation-building in Kung-Fu is important as it is to a building project. A building's size and height is governed by it's foundation. We certainly could not attempt to erect a high-rise building on a foundation that was meant to support a small house. To relate this, in Kung-Fu if one only prepares for a minor attainment that is where they will stay. If major or better attainment is desired, one must fortify their foundation. In other words, the foundation must befit the project. With a solid foundation, one can plan and build to their own desire." "Kung-Fu practitioners should from the beginning build a foundation that is meant for a major attainment, or at least moderate attainment. It was on this belief that Kung-Fu practitioners of the past paid undivided attention to foundation building. It was not unusual to see beginners being told to do so for up to three - five years before the first punch was thrown." Grandmaster Ip Ching and Garry in Faat Saan, outside the ancestral hall. "Just as a school has a curriculum to guide its smooth operation and overall teaching policy, in Kung-Fu a systematical and gradual process of instruction must be devised so that progressive teaching can be done. But unlike schooling in which a gifted student may skip a year or two, in Kung-Fu we cannot skip any part of it. There is only repeating and repeating if the result is unsatisfactory." "Kung-Fu is closely connected with developing physical ability, it cannot be rushed through. This is what makes Kung-Fu a difficult art to master. During the first three years of basic works, one must be most consistent in the training regardless of weather and personal hardship, and there can be no respite." "There are personal sacrifices and restraints, and there are also rules and etiquette to observe. In the past when the master and student relationship was much more formal, the sifu or instructor had the utmost authority, all rules and etiquette must be strictly obeyed or the student would not receive complete instruction." "Serious offenders were often ejected out of the establishment, some were even punished in a cruel manner. The road to success in Kung-Fu was then, and is now, a rocky and bumpy one." 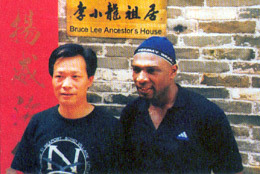 Garry with Sifu Ha Ji Sing outide Bruce Lee's ancestors house in Seun Dak, Southern China. "Nothing is insurmountable, Kung-Fu is not an exception. A competetent and dedicated instructor plus personal determination and capacity to work is the formula of success. There is no overnight success; a day's work adds an edge to the total attainment, amonths work adds a bigger margin. Kung-Fu takes time to mellow and mature. It is not for the opportunist. It is neither easy nor difficult so long as practitioners do not stop at the thought of hard work, nor should they assume that there is an easy way to success." On Saturday 20th October 2007 The Wing Chun School (TWCS) hosted a surprise thank you event for Sifu Garry McKenzie, in recognition of the 25 years contribution, dedication and commitment he has made to the Wing Chun art form. Even though arrangements began in June 2007, the idea was but a mere seed 2 years prior to this. The branches under TWCS were represented by their Sifus who met together regularly to discuss and plan how the event would take place. It took much discretion and nail biting by all to ensure that this auspicious occasion would not be revealed until the day of the event. Many students found it most difficult to conceal the event as it meant being evasive to avoid 'letting the cat out the bag'. Elaborate excuses were made whilst students met together to practise demonstrations. But today we laugh as it was only a temporary period of being economical with the truth. "Just sit back and enjoy the day"
"The day!!!" came an astonished exclamation from the man himself. Once seated the day began with a steady stream of students presenting their demonstrations. They were individual, robust, varied and energetic and most of all a true representation of TWCS combative approach to the art form. None of the students or Sifus had seen individual demonstrations nor had they had a practise run through prior to the day. As the power of the chain punches resonated through the room and children performed the Siu Nim Tau Sifu Garry and students were impressed by how each school had been so diligent in putting together their demonstrations. Words of thanks from absent friends were shared acknowledging the opportunity Sifu Garry has given and continues to give to each and everyone of us by passing on skills and precious knowledge. The event ended with a photo montage of Sifu Garry's journey through his Wing Chun career mapping his influences including students, masters, travels and his religion. Individuals, none more than Sifu Garry himself, were overwhelmed by the magnitude of the event and the genuine affection felt amongst TWCS family. Finally Sifu Garry graced the floor with words of thanks. Whilst the students gave thanks to him he in his usual humble and calm manner returned the thanks to his students. He reminded us that without his students he would not be here today nor the Sifu he is. As he always states a student is always looking for a good teacher but a teacher is also always looking for a good student. A special thanks must go to Si Mo Julie for her planning, organisation and co-ordination for the whole event in conjunction with the Sifu's and Student's of The Wing Chun School.